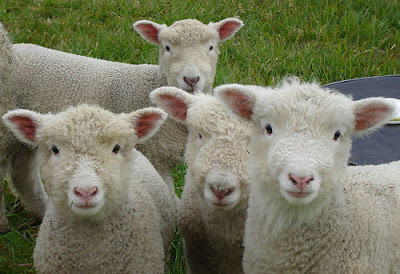 The Sheep Whisperer: "Underground" Heroics! The Ant, an insect that is mentioned in the Bible in a positive light, is our next topic of study in Character. Ants are known for their diligence & their service to their queen. 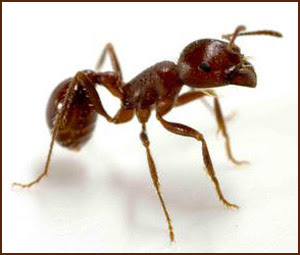 Scientists estimate that there are 1.5 million ants for every human being on the earth! 12,000 species inhabit every continent except Antarctica. That's odd, because the one continent I thought would have ants, doesn't! As a Harvester ant, I have a ? for Ewe. Can Ewe carry 50x ewer weight? 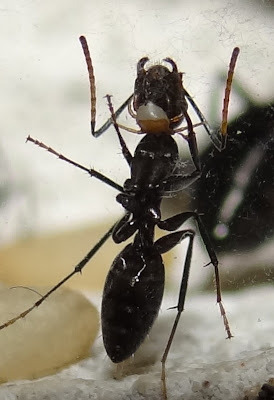 While the queen is the mother of most in the colony, the ant colony is actually run by older servant-leaders, who lead by example. As diligent servant-leaders, ants do what needs to be done, without being asked! Younger ants model the behavior of older ants & the work gets done! If only they could "lay hands" on our children! Wouldn't that make kid's chores run more efficiently? As scouts, we gather food by leaving a trail for others to follow! 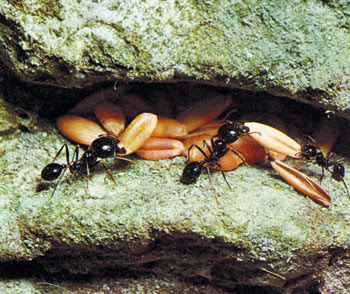 Harvester Ants are very industrious .They cultivate seeds & then store them in underground granaries. If water seeps into the granary, the ants will take each seed to the surface to dry, which requires a tremendous amount of time & effort. Another example of diligence is seen in their use of aphids. Some ants will volunteer to gorge themselves & act as living "milk tanks", storing aphid's secretions for future use. They hang suspended, in an act of Service for the good of the colony! The Ant is a great example of a diligent servant! 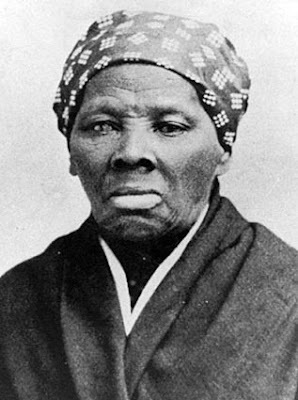 An individual that has displayed this same Diligence & Service during her lifetime was Harriet Tubman. Born a slave in 1820, Araminta Ross worked on a Maryland plantation, "Minty" was raised by Christian parents, & at age 11, was working in the fields. Eventually, she was called Harriet, which was her mother's name. At age 13, she was hit in the head with a 2lb. weight, trying to shield a runaway slave from his master. As a result , she was in a coma & suffered with terrible headaches & a "sleeping sickness", which caused her to black out for periods of time for her entire lifetime. "There are 1 or 2 things I have a right to, Liberty or death." At the age of 24, Harriet married John Tubman, a free black man. She expressed to him a desire to be free, however, he was not in favor of her escaping & threatened to tell the master if he heard anything else about it! Harriet still believed she had a right to be free, so she was determined to pursue her dream. In 1849, She fled via the "Underground Railroad", which was comprised of a number of farmers & Quakers who hid & transported her to freedom in Pennsylvania. She was finally free, with a burden to free others. "I never ran my train off the track, & I never lost a passenger." 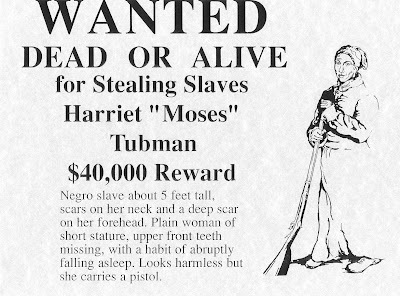 Harriet found work in Philadelphia & saved some money to help her in her quest to free other slaves. 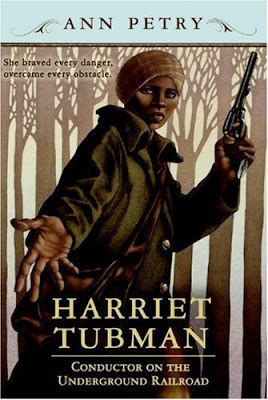 As the conductor of the Underground Railroad, Harriet risked her life often. She made 19 trips back into the South, diligently helping over 300 slaves escape to freedom. She returned to take back family & anyone desiring to be free. During the Civil War, she served her country as a spy & a nurse. She fought slavery & served her fellow man until she died in 1913, at the ripe old age of 93. I was called" Moses" because of leading others out of slavery! Sheep are cared for by Shepherds that display noteworthy service & diligence! Shepherds know a secret that both ants & Harriet have discovered. They know that real life is all about laying down Ewer life for others! We're thankful for Shepherds to look out for us! Hip, Hip, Hooray! Ewe to the people today, that need His touch. I'm glad it blessed Ewe, Brother! Thanks for the encouragement! God Bless Ewe!